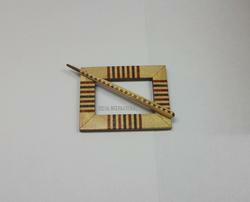 We are manufacturer and exporter of wooden shawl pins in various woods and designs. We make stunning designs of these shawl pins to give an elite look to your winter wear. 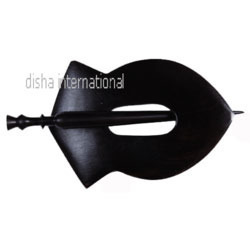 Our shawl pins are made with excellent smooth finish and international quality finish. We use Ebony wood, Rose wood, Sheesham, Kadam, Teak, Surina & many other high quality woods. Double Tone Knitting Needle is handcrafted by our expert artisans with their inherited skills from their forefathers which is fading with time. 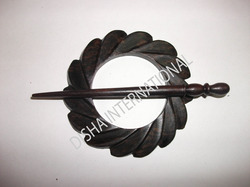 This round shalw pin is made in EBONY wood with intricate leaf pattern. It is given a nice smooth finish which surely will enhance the beauty of your attire in any party. This pattern can be made in Ebony, rose wood, bamboo, kemp wood or Bamboo. We have many more patterns available for you to select. We are majorly looking for enquiries from U.K, Europe, USA and other international markets. We are offering customized products. we are manufacturer and exporters of wooden shawl pins to many wholesalers and importers in U.K. Germany. Italy, Spain, Australia, Netherlands, New zealand, Austria and many other countries including U.S. This shawl pin is made of multiwood. Many other shapes are available in multiwood. 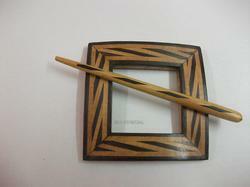 We make these shawl pins many other woods like Ebony, Rose wood, Kadam wood, Sheesham, Teak, Surina, & many other woods. We assure you for the finest finish and smoothness on our wooden products. You will surely realise it once you see & use the product. Excellent gift for any occassion or for any member of the family or family friend. With the support of our experts and sophisticated in-house facilities, we have been able to offer an array of Wooden Shawl Pins that are highly admired by our clients for their stunning patterns and smooth finish. The offered pins are manufactured with optimum quality wood and modern technology. Furthermore, offered pins are highly acclaimed in the industry for their varied specifications and such other qualities. Moreover, these pins are available at pocket friendly prices. We are offering these pins with customized designs. We have set a benchmark for manufacturing, exporting and supply of Wooden Shawl Pins as this is hugely in demand by our clients. The offered shawl pin is made of ROSE Wood. We have many different designs and patterns of shawl pins available with us in various woods. Your own designs can also be given shape to perfection by our expert artisans who are in the industry since their birth. W also make these shawl pins in multi wood, combination of different color woods. All shawl pins are made with the finest finish available in the market today and we stand gaurantee to this. Shawl pins available with Mat finish or high polish as per buyer's specifications and requirements. We are dedicatedly engaged in manufacturing, exporting and supplying a matchless range of Rose Wood Shawl Pin to our esteemed customers. 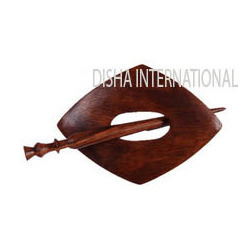 Offered shawl pin is made up of superior grade wood and the latest technology by our skilled professionals. Our experts test this shawl pin against predefined parameters of quality in order to ensure its quality. Moreover, we provide this shawl pin at market leading prices. We are offering customized products. Owing to the dedication of our diligent professionals, we have earned a reputed name in manufacturing, exporting and supplying the finest quality assortment of Wooden Shawl Pins that are available in varied sizes and shapes for our clients. Offered pins are manufactured in compliance with market laid parameters by using high quality wood and innovative technology. Along with that, our valuable customers can avail these pins from us at competitive rates. We are offering customized products.